Substantial social, economic and political changes began after Lithuanian Independence has been restored in 1990. These changes became especially active in 2004 when Lithuania joined the European Union (EU). Lithuanian population dropped by 23 percentage points since Lithuania regained its independence. There are two main causes of this population decrease: high emigration and negative natural population change. According to the official statistics on average 50 thousand people left Lithuania annually during the timeframe of 2010 to 2017. The emigration rates per thousand people are the highest in the EU. The negative impact of the emigration is offset a little by an increased immigration flow to Lithuania. Natural population change is a change of the population and its composition that are related to birth and death. There are three main causes of death in Lithuania: cardiovascular diseases, malignant tumours and external factors. These three causes account for 84% of all deaths, according to the 2015 data. First let’s look at the main external causes of death because EMS should be focused on the service demand. Difficult to understand why? But suicide is one of the biggest external causes of death in Lithuania. Suicide rates in Lithuania exceed the EU average suicide rate by more than three times. Other external causes are car accidents and falling accidents. Also, many deaths are caused by the large alcohol consumption. An ischemic heart disease is another factor influencing the EMS demand in Lithuania. Statistical data about the Lithuanian EMS is not collected. The extent of the EMS is best represented by the absolute number of ambulance care services, which has decreased by 2010 but it reached 1993 level again by 2015. The number of the ambulance care services increased due to the closures of some hospitals in regional centres. The ambulance care services consist of four main groups: acute illnesses and conditions, accidents, transportation of patients and pregnancy/perinatal pathology. 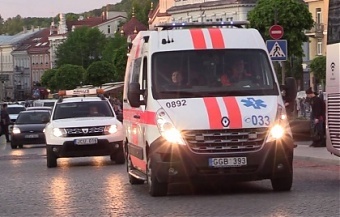 The volume of ambulance care services for the urgent illnesses and pregnancy related conditions have decreased but the numbers for the injuries and patient transportation increased. Urgent illness group consists of patients that seek care for the circulatory system diseases, oncological illnesses or respiratory failures. Although the volume of the ambulance care services from 2001 to 2015 has been increasing very slightly, the dynamics of the ambulance care staff undergone more significant changes – the nursing staff dropped by 25% and the medical doctor staff decreased by 81%. Such a sharp decline in doctor staff is related to the new ambulance care service concept that was approved in 2002, according to which patients in most cases are transported to the doctors in ambulances, the so called Anglo-American model. Doctors are replaced by the paramedic staff. Lithuania’s Health care system is divided into three political and administrative levels: National Health, County Health, and Municipal Health. Its emergency care is free which is financed from Compulsory Health Insurance Fund and by the Government (for citizens without health insurance). The scope and requirements for the provision of the emergency care, including urgent care and ambulance work, are regulated by the Ministry of Health. Emergency care is commonly provided by general practitioners during services hours. Alternatively, and during the general practitioner out-of-hours services, it could be provided by the emergency departments at the hospitals. Lithuanian EMS system was built taking into account the most effective EMS management models and applications from other countries. Lithuanian EMS includes: 1) pre-hospital phase, during which an initial medical care is provided to a patient at the place of an accident before the patient is taken to the nearest hospital; 2) inhospital phase at the nearest hospital, during which urgent and effective medical care is provided to a patient to minimize the trauma or illness effects and the possibility of death; 3) inter-hospital or transfer phase when the patient‘s condition has been stabilized and the continuation of the medical care could be provided at another medical institution based on the specific patient needs; 4) post-hospital phase, during which the patient is transferred to the rehabilitation facilities for further treatment. The research of the Lithuanian EMS system and its management was carried out jointly by scientists of Klaipeda University and Klaipeda University Hospital during 2015-2016. The research method was a Quantitative Analysis, and the instrument was four types of surveys. Respondents were chosen based on the competency: managers of the inpatient personal health care facilities and ambulance care services, managers of the intensive care units, and Heads of the Emergency departments. General set consisted of 168 persons related to the EMS system management. Survey volume was 117 from all over Lithuania. Survey sites included 60 hospitals and 19 ambulance care centres. The following EMS management tools were analyzed during the study: the optimal number of the emergency care categories, their names and service times; the introduction of the fee for the non-urgent care services; initial assessment of the patient’s condition performed by the nursing staff; location of the patient transportation; the determination of the Emergency Department employment indicators; the introduction of payment for the patients transfer between hospitals; emergency care coordination; a separate phone number for the ambulance care; mixed pre-hospital service model; use of the military medical staff; determination of the performance criteria; control of the emergency patient external and internal flows; regulating the patient transportation between hospitals; implementation of the standard protocol of the patient examination; providing information to the family doctors. EMS process that includes coordination, command, urgent medical care at the place of accident, pre-hospital transportation, assessing patient’s condition and providing first care, and transportation between the hospitals was analyzed during the research. Since the proposed model has both American and German emergency care elements, it was proposed to have a mixed emergency care model. The analysis of the research data revealed that legal and general management methods should be used to achieve Lithuanian EMS system management goals and objectives. The study identified the following control weaknesses within the Lithuanian EMS system: lack of legal regulation within EMS system; inadequate assessment categories resulting in excessive patients flows; lack of approved protocols, algorithms and performance standards; lack of skilful and qualified resources; lack of EMS quantitative and qualitative performance measures; lack regulation within patient transportation between hospitals; lack of emergency care system funding; inadequate public awareness and education. The following EMS availability and quality improvement measures have been proposed: patient selection should be optimized; quantitative and qualitative indicators within Lithuanian EMS should be developed and implemented; competencies of the nursing staff should be enhanced and the military medical staff should be used; establishment of regulations within; external and internal patients’ flows should be regulated; long-term EMS management system should be developed and implemented; public knowledge and awareness should be enriched. In summary, the possibilities for the improvement of the management of the EMS system, the scope of EMS further application remains broad, and the presented improvement measures and developed model can already be successfully used to improve the availability and quality of the Lithuanian EMS. The proposed management of the patient flows and the regulation for the payment of emergency and emergency medical service is already being discussed by the Lithuanian Health Policy owners; therefore, it can be expected that the emergency medical service in Lithuania will become even more urgent in the future.